Microsoft, apparently expecting healthy sales, said it would provide an updated timetable for Surface Hub production at the end of August. Businesses eagerly awaiting Microsoft’s mammoth Surface Hub will have to wait a bit longer, as Microsoft said it plans to delay production past the original September 1 launch date. Microsoft said it was preparing for “production at a broader scale,” part of a plan to widen the distribution of its desktop Surface tablets from a few hundred to a few thousand across the world in the coming months. Microsoft said it would provide an updated timetable for Surface Hub production at the end of August. Microsoft announced the Surface Hub in January, with a touch-optimized display up to 84 inches that’s been designed for collaboration. But the displays themselves will also be priced at up to $20,000 apiece, probably providing a hefty profit for Microsoft. Ramping up production could certainly mean Microsoft expects sales to be better than expected. Microsoft also said it has had a “somewhat limited business channel” for sales of the Surface Pro 3 and Surface 3. According to the company, both tablets are selling at a clip of about a billion dollars per quarter. The company said that it was seeking more Surface partners through a dedicated Microsoft Partner Network Device Partner Portal. “This expansion of our partnerships is directly related to our optimism for much broader success that will come with the release of Windows 10,” Microsoft said in a blog post. 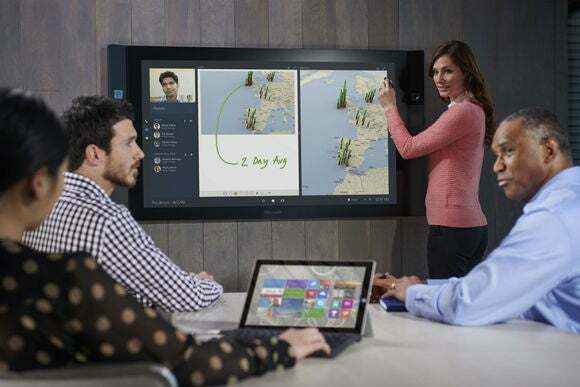 Why this matters: Microsoft would obviously prefer that businesses plan to buy a $20,000 touch-based collaboration tablet to adorn their conference rooms than a much cheaper projector and/or videoconferencing system. However, we’ve probably all seen those same rooms adorned with videoconferencing systems that are set up but never used. Will the Surface Hub be the next corporate boondoggle, or will businesses be able to take advantage of them? That’s a task that a Microsoft and its partner base will apparently be asked to take on—and based on its new production plans, one that Microsoft is confident they’ll solve.